Ryn is facing some problems with one of her pack on Siren and it doesn’t look like things are going to be letting up any time soon. When the ex-leader (Katrina) comes back to the group after being kicked out she drops a dead wolf at Ryn’s feet – the gauntlet has been thrown and we are curious to see what this means for Ryn. Is the group going to turn on her or will they stand strong behind her leadership? Let’s find out! Anyone who reads CarterMatt knows that we love Siren and watch it religiously, but can we talk a moment about this opening scene where the sirens, who barely have their land legs together and have not really hunted on land before, have become these ultra land hunters chasing down deer like they’ve had legs their whole lives? We’ve enjoyed the mythology and have suspended a certain amount of disbelief which you have to with a topic like mermaids, but if your’e going to tell us that Sirens are on land so infrequently that they have to learn what poison ivy is, or what laughter is then how are they able to hunt on land like they are in sea? Very different terrain, with a very different body they have barely used. We fully understand that they are still mega-predators sea they are the top of the food chain, but on land – it’s a different story – like putting a lion in the water and expecting it to be just as good at hunting as it is on land. It was a bit weird, especially since deer isn’t even something they would be familiar with to hunt as food – they eat fish. And at the end of this “hunt” they end up back at the cabin where Ben and Maddie give them.. wait for it… FISH. When Ryn reveals to Ben and Maddie that her skin is scaling again and that she needs to go back in the water soon, she knows that Katrina will try to usurp her place while she’s gone. Add to that the fact that the oil drilling company has expanded their map and there’s almost no where for Ryn to go to get back in the water and there’s a real problem brewing here. Maddie finds a sea tank in storage and suggests that they fill it with sea water and she can safely turn back into a siren for as long as she needs (and with the sheriff sniffing around Ben’s cabin this could be safer for all the sirens). Katrina is starting to plant the seed that Ben is the leader of the group and not Ryn and once Katrina learns that Ryn is getting weaker she waits for her chance to strike. While Ben and Maddie fill the tank with sea water Katrina takes her shot at killing Ryn. She gives chase back to the tank and they both fall in giving us one of the most epic and frightening mermaid fights we’ve ever seen. It was powerful, scary and ended with Katrina getting her head knocked into the side of the tank with Ryn being the winner however it wasn’t without consequences. Ben tried to help Ryn win the fight when he starts to hear her song in his head again and afterwards she was upset with him for interfering with their way of doing things. Ben and Maddie explain to Ryn that her song was in his head when he tried to help her with the fight and Maddie suggests that they try to find a way to understand the song so that they can then find a way to block it. They try to record it, but Ryn can only sing to a human, so Maddie agrees to stay in the room with noise canceling earphones. The experiment doesn’t go exactly as planned – while Maddie can’t hear the song she is still pulled into Ryn’s song anyways. Now that the song is recorded Ryn says that she doesn’t need to sing anymore, but admits to Maddie that after singing to Ben that all she wants to do all the time is to sing to Ben. We haven’t had a good Helen plot yet this season, but tonight brought us a really good one! Helen has long thought that she is the last in her lineage and because of that she has been able to strike this deal with Ben’s dad who has been paying her to keep quiet for years. After asking for a much larger sum of money (to feed and house all the siren’s for 8 months) he gave it to her, but Ben’s mother put a hold on it and then swiped a cup of Helen’s to do a DNA test. Then the results come back it turns out that she is indeed related to them, but that she has a relative that doesn’t live too far away named Rick. Ben’s mom is sure they are scheming together but Ben thinks Helen doesn’t know about him. Ben leaves his mother with a lie that gets her to free up the money, saying that Helen has an auto-immune disease and that she needs the money to cover medical bills. When Ben brings this information to Helen she overlooks the betrayal from Ben’s mom because she’s excited at the thought that she has family! When she meets with Rick she sees that he has some skin scaling issues as well and while it may not have been the perfect reunion, she knows that there’s someone out there like her. 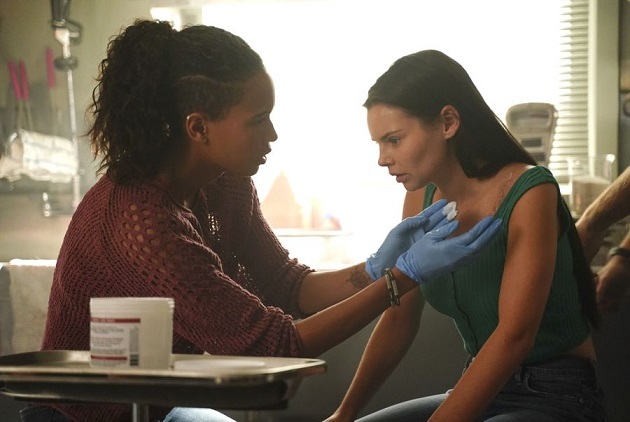 Related – Check out what’s coming up next time on Siren! There was a lot of flirty, smiley, touchy moments tonight with Ben and Maddie and it was really nice to see. While there are a lot of different ships currently floating around on the show (Ben and Maddie, Ben and Ryn, Ryn and Maddie, all three of them together) there was such a beautiful chemistry with Ben and Maddie right from the start of season 1 and we loved diving into that again tonight after how rocky things have been.